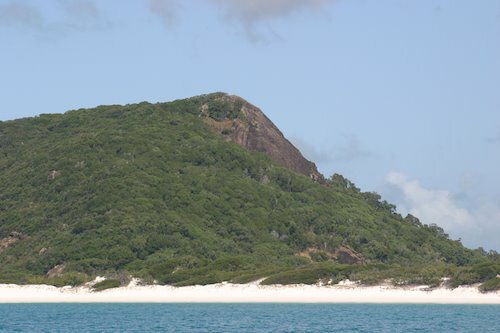 We spent a gentle day circumnavigating the northern half of Whitsunday Island, finishing up at the popular Tongue Bay. A line of yachts was wedged in against the south-eastern shore, but as we approached the pack broke up and many of them left. Quite a few of these seemed to be old J-class racing yachts, apparently being run by the tourist resorts as they each had over a dozen people aboard. Those of us that remained suffered a mild but unusual swell for the rest of the night. I went up on deck a few times to see if I could work out what was happening, but although throughout the night the wind and tide had us facing almost every point of the compass, on every point we were getting a mild broadside swell. Very odd. After breakfast we popped around the corner to the famous Whitehaven Beach, renowned home of the finest white sand in the world. It was a glorious day. We anchored a couple of hundred metres from the shore and then swam in. The sand was almost painfully white, and the consistency of flour. We amused ourselves by following nicely defined animal tracks in the dunes, and watching the numerous sting rays foraging for food in the shallows around our feet. I’ve never seen so many rays being so bold. They weren’t bothered by us at all, and one big one was perfectly happy for me to wade alongside it as it swam slowly up the beach. Apart from some clusters of resort folk over a mile away at each end, we had the beach pretty much to ourselves. After swimming back to the yacht for lunch, everything changed; power boats and jet boats roared up to the shore and discharged dozens of people with cool boxes, and a helicopter flew in to deposit another load. Tenders came in from two super-yachts out in the bay, one of them an astonishing mirror-finished ketch which must have been a hundred feet long. It was time to leave. There was no wind at all, but the forecast was for a northerly change, so we motored over to nearby Hasleton Island and anchored up against the reef in Whites Bay. There was nobody else there, which made a nice change, although a small liveaboard showed up later. The skipper commented in passing that he’d been hoping for some peace and quiet, and then anchored so far away from us that we could barely see him in the gathering dusk. Standing in the dark with the moon still below the horizon, we noticed intermittent flashes of light in the water. This wasn’t the usual phosphorescence of tropical plankton but something different. We spent a happy half hour or so hanging over the rail with a spotlight trying to work out which of the myriad creatures was making the light. We narrowed it down to either the millimetre swarms of zooplankton, or the yellowish thumbnail-sized fish that were feeding on them while simultaneously either laying eggs or defecating, or the finger-sized silver-blue fish that were coming up from below to feed on everything else. Satisfied that we had in fact no idea what was going on, we settled down to a quiet evening of baking, eating, and cribbage. This entry was posted in Australia, Oceania, Travel, Voyage of Pindimara and tagged Sail, Whitsundays on 2009/07/13 by Reinhard.